Home / Self improvement / How Much Protein Do You Need In Your Diet? 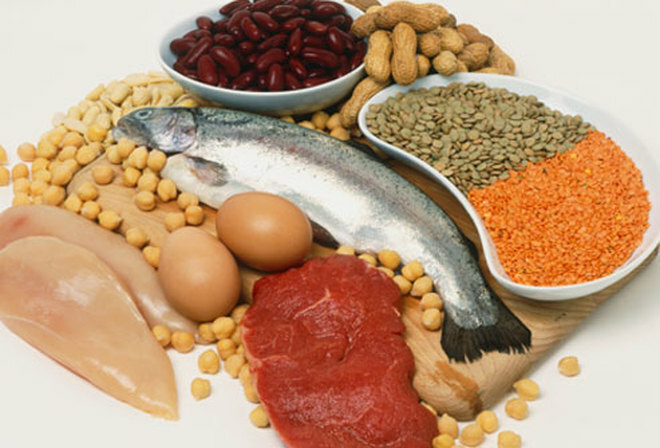 Proteins are long chains of amino acids that are the essential components of any living organism. Proteins are very important to ensure that the body functions properly. Our bodies cannot live without proteins. Why Do You Need Proteins? Strengthening of body tissues – hairs, nails, muscles, etc. Storage of essential vitamins and minerals. One example is iron. Everyone usually fulfills their protein needs with their diet. Protein deficiencies are rare in developed countries because people can easily obtain their protein levels with the meals they eat. However, protein overload may be seen in some people. It may result in different medical conditions like gout, obesity, etc. The formulas mentioned above give you the minimum and maximum grams of proteins that you need every day. Athletes: People who are very active, especially runners require much more protein than ordinary individuals. This is because proteins play an important role in the strengthening of muscles. If athletes do not intake sufficient amount of proteins, their muscles do not get enough energy which may cause muscle cramps, tightness, weakness, and eventually muscle wasting. Body builders: People who love performing heavy weight exercises are highly dependent on protein. They would never be able to make muscles if they do not take protein in excess. Pregnant women: It is necessary for pregnant women to meet their body’s daily protein requirement. During pregnancy, women may suffer from slight increase in blood pressure which referred to as preeclampsia in medical terminology. In this condition proteins are excreted out of the body along with the urine which may cause protein deficiency. It may be harmful for the fetus. Therefore it is necessary for pregnant women to have a diet that is rich in protein. People suffering from gout: An increased level of uric acid in the blood is called gout. It is a condition that affects your joints and causes pain in small joints. It is caused due to an excessive amount of proteins in their diet. People suffering from gout must cut down the amount of protein that they are eating per day. People who have developed gastrointestinal disorders: Proteins are unquestionably very useful and important for the body but proteins may cause harm to the people who have a defective digestive system, especially the people who have developed ulcers. Such people should avoid intake of proteins and should try to consume lesser proteins. This is because proteins activate our digestive system which worsens the ulcer pain. Injured people: Proteins tend to increase the healing of muscles and skin. It is necessary for injured individuals to consume some extra proteins to increase the healing power. Remember, anything in excess is harmful – some are more, some are less. Proteins, if taken in excess, may cause excessive production of ketones and ketone bodies. Ketone bodies produce bad breath – halitosis. Besides that, higher level of proteins may increase muscle mass which may cause muscle tightening which results in declining of proper functioning of the organs, especially the heart. Proteins, when in excess, begin to convert into uric acid which later on forms uric acid crystals. These uric acid crystals tend to accumulate in small joints causing joint pain. This condition is called gout. What If I Do Not Meet My Daily Protein Requirements? Your body needs to meet the minimum daily protein intake each day. People who fail to maintain their body’s protein levels for a long period of time tend to suffer from various disorders. Muscle wasting is one of the most harmful effects of protein deficiency. Proteins are required to hold the blood inside the vessels. In the case of protein deficiency, blood starts to leak out of the vessels which results in general edema. Frequent infections, weight loss, and muscle weakness are caused due to protein insufficiency.